A widget that marks its child as being a candidate for hero animations. When a PageRoute is pushed or popped with the Navigator, the entire screen's content is replaced. An old route disappears and a new route appears. If there's a common visual feature on both routes then it can be helpful for orienting the user for the feature to physically move from one page to the other during the routes' transition. Such an animation is called a hero animation. The hero widgets "fly" in the Navigator's overlay during the transition and while they're in-flight they're, by default, not shown in their original locations in the old and new routes. To label a widget as such a feature, wrap it in a Hero widget. When navigation happens, the Hero widgets on each route are identified by the HeroController. For each pair of Hero widgets that have the same tag, a hero animation is triggered. If a Hero is already in flight when navigation occurs, its flight animation will be redirected to its new destination. The widget shown in-flight during the transition is, by default, the destination route's Hero's child. Routes must not contain more than one Hero for each tag. Heroes and the Navigator's Overlay Stack must be axis-aligned for all this to work. The top left and bottom right coordinates of each animated Hero will be converted to global coordinates and then from there converted to that Stack's coordinate space, and the entire Hero subtree will, for the duration of the animation, be lifted out of its original place, and positioned on that stack. If the Hero isn't axis aligned, this is going to fail in a rather ugly fashion. Don't rotate your heroes! To make the animations look good, it's critical that the widget tree for the hero in both locations be essentially identical. The widget of the target is, by default, used to do the transition: when going from route A to route B, route B's hero's widget is placed over route A's hero's widget. 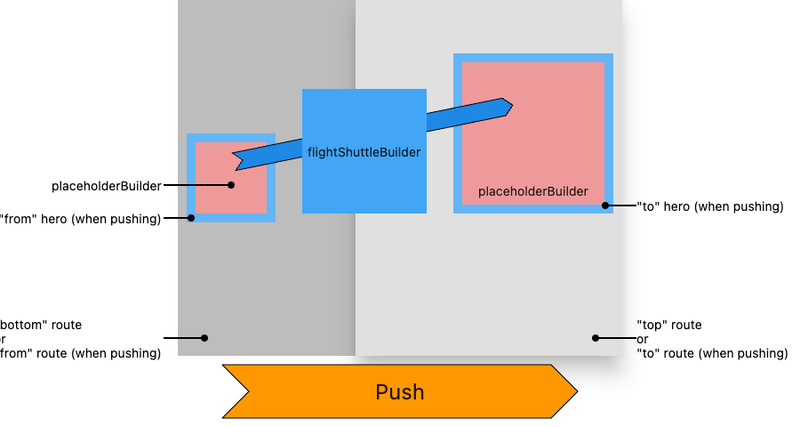 If a flightShuttleBuilder is supplied, its output widget is shown during the flight transition instead. By default, both route A and route B's heroes are hidden while the transitioning widget is animating in-flight above the 2 routes. placeholderBuilder can be used to show a custom widget in their place instead once the transition has taken flight. During the transition, the transition widget is animated to route B's hero's position, and then the widget is inserted into route B. When going back from B to A, route A's hero's widget is, by default, placed over where route B's hero's widget was, and then the animation goes the other way. The identifier for this particular hero. If the tag of this hero matches the tag of a hero on a PageRoute that we're navigating to or from, then a hero animation will be triggered.